The project I share with you today is a personal favourite of mine. I hope you will like it as much! There are many jewellry holders on the market, but most are boring or stand around and take up a lot of space. Jewellry is so pretty, it should be used to decorate your home, not be a enervating piece of clutter. So I decided to create a piece of wall art that served as a jewellry holder. I love art noveau womens portraits and this was the moment to hang one up! If you are worried your artistic skills won´t match this project, don´t worry, I have a couple of ideas how to do this even if you can´t draw and paint all that well, so just read on. 1. First thing is looking for inspiration. 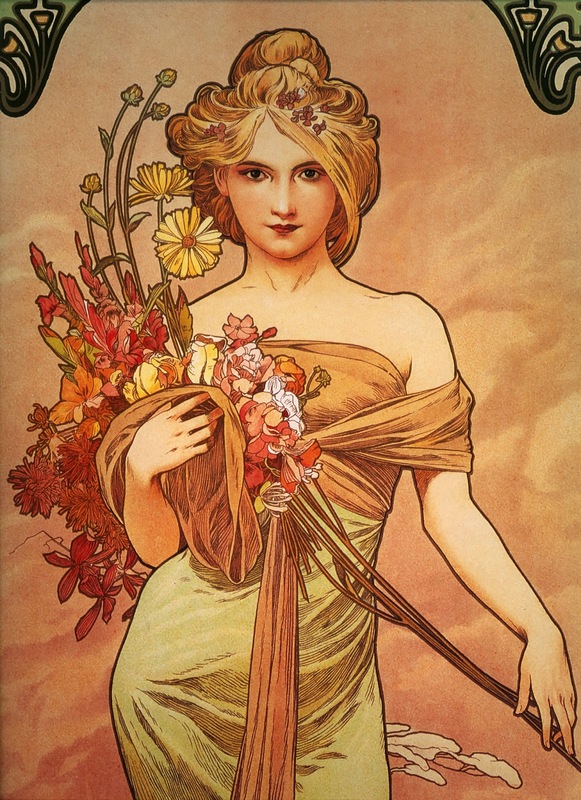 I chose this portrait of Alfons Mucha as my example. 2. Take the cork board and cover it in a couple of layers of white paint. The paint dries quite slowly on the cork, so it takes some time. portrait, just print the picture on the right and trace the lines in chalk. Than you can transfer the outlines onto your cork board. 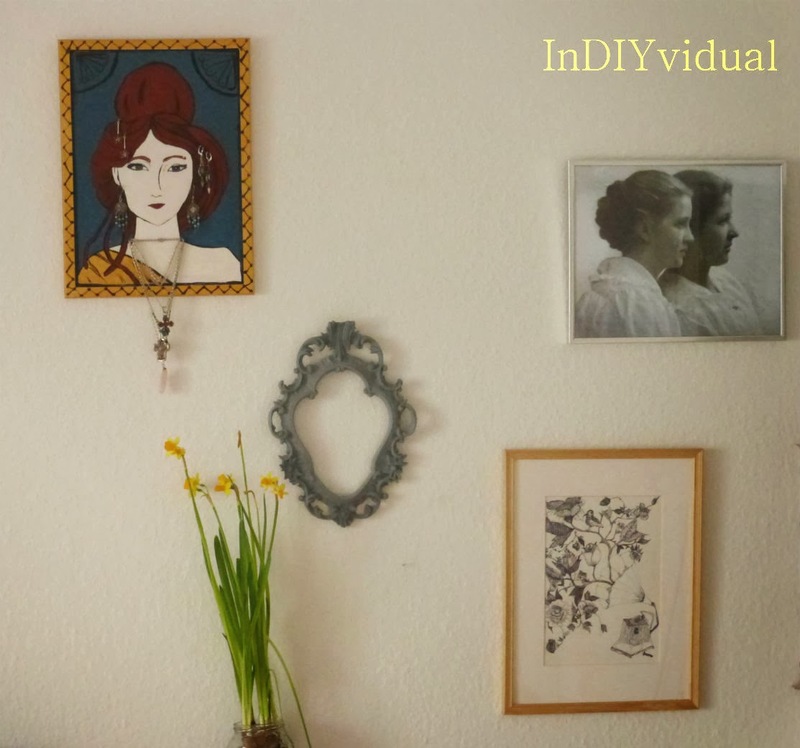 If you want to create your own portrait, important features of art nouveau portraits are the big hair, big eyes, small nose and mouth and the draped dress. Ornaments will be added through your jewellry. The good thing is that it can be simplified. Me, I did a very simple nose cause I don´t like painting noses. should be nearly symmetrical. But if you mess up, another layer or two of white paint will erase all your problems. It is important to put slim black strips in the iris to create striations and make the eyes look more real. Also, leave a dot of white in the pupil! 5. Once the outlines are done, it is time to fill them with paint. This is pretty simple, because you don´t have to do any shading. The colors can be switched around as you like. 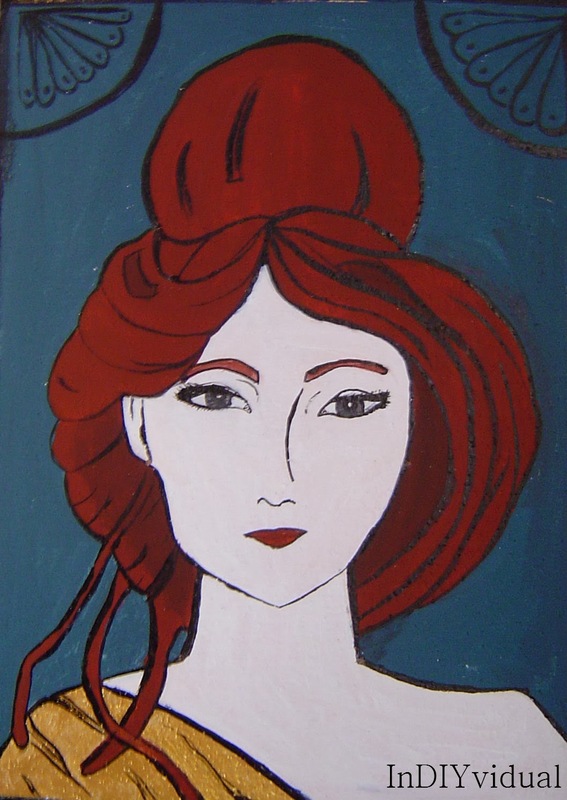 I chose reddish brown hair (maybe I subconsciously tried to do a portrait of myself?). Personally, I adore the metallic sheen of the dress! 6. Once the paint has dried, repaint or redraw the outlines. 7. With just the portrait the board looked a little empty, so I added art nouveau-like ornaments in the upper corners. Then, I painted the frame in the same gold as the dress and adorned it with a black pattern. The dots I made with the end of my brush. I did it free handed, but it didn´t turn out all that even, so I would use a ruler if I were to do it again. The copyright on his works has ended, as he died more than seventy years ago, so you can legally download the pictures. Open the picture with a programm like pixlr.com and crop it to the face. Get it printed the size you need at the copy shop or as a photograph. Glue the picture to the cork board. I think spray glue would work best. And this easy, you have nearly the same effect! 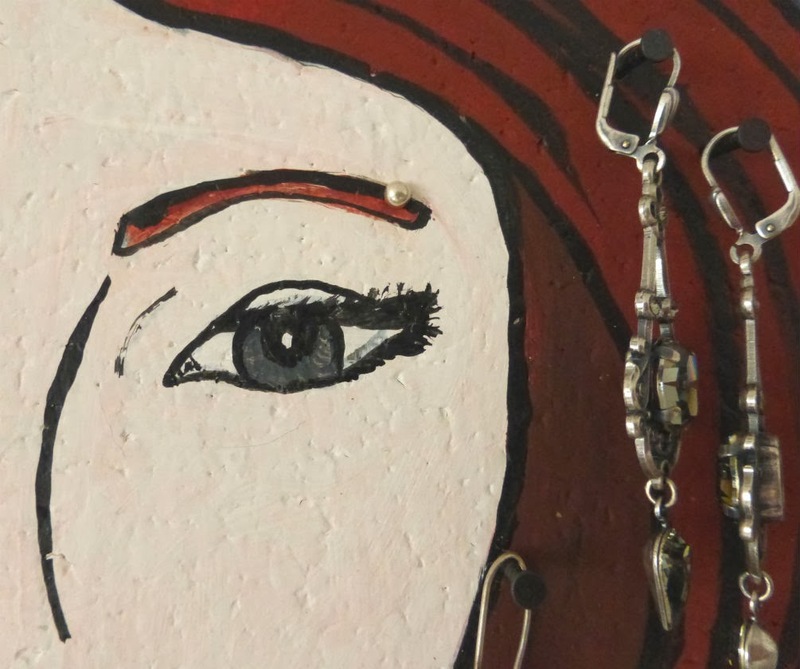 8: Use the nails to create a few holes to put in ear studs. Then, fix the nails in the cork. For the necklaces, I put in three nails in a triangle. 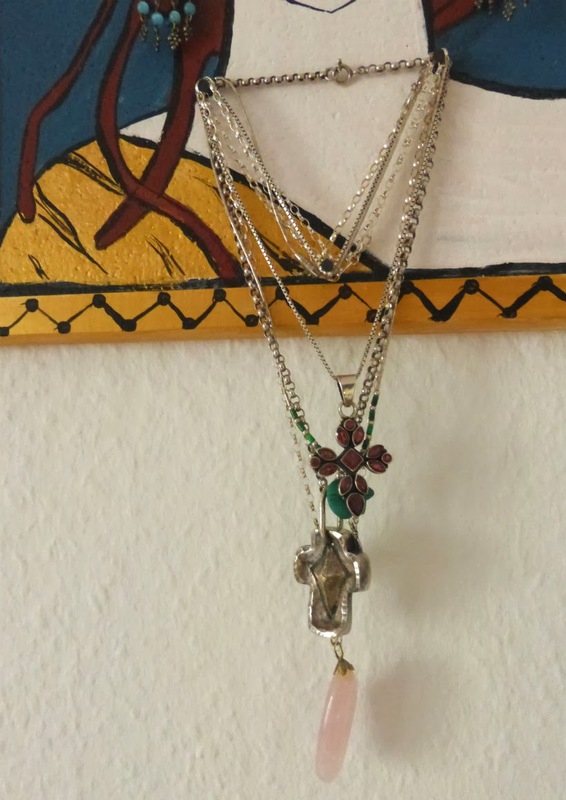 This way, I can shorten the necklaces by wrapping them around the middle nail. 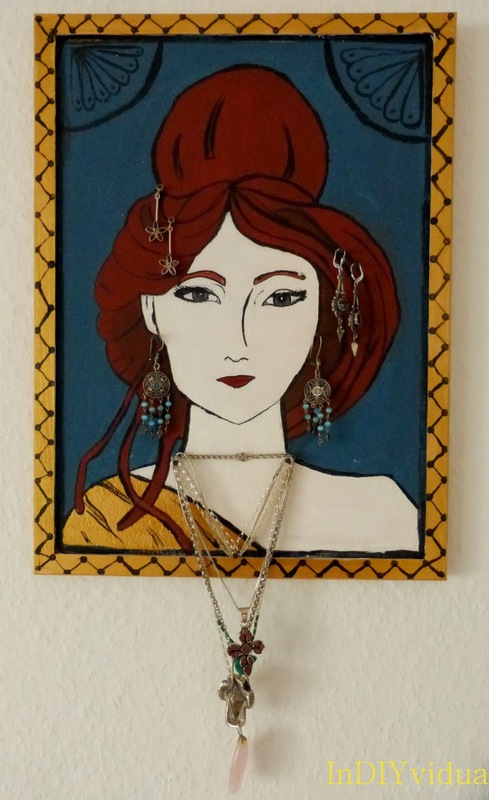 Put on your jewellry and hang up your combined artwork and jewellry board.